Joseph was the favorite son of Jacob. He stood out, not only when he was wearing his coat. He was the first born son of Rachel, and the eleventh (out of 12) son of Jacob. He stood out for his righteousness and for living in faith and devotion to ADONAI. Joseph wasn`t afraid to show his colors. When his father Jacob gave him the many-colored tunic, he wore it. When he had dreams that spoke of his position in the family, he blurted them out to his brothers. He was just seventeen. It wasn`t a matter of pride, but maybe something of his genuine heart and an expression of someone who didn`t hide his light. He didn't try to hide from wearing the colors that showed that he was a beloved son of not only Jacob, but of the LORD God Almighty. That is a great lesson in this parsha. For me it rings brightly. I sometimes hide who I am. I did so for 40 years with my Jewishness, and now I don`t want to do that anymore. In a world where so few people put their trust in God, we sometimes have to be really bold to not only do so but to say we do. When the baker and cupbearer asked about their dreams, Joseph said only God can interpret our dreams. He put his trust in God at all times and made it clear that he wasn`t in anything for his own glory, but rather always gave praise and glorified ADONAI, to the point that whatever circumstances he was in, he blessed all those around him and he always found favor with the LORD ...even under such circumstances as when he was sold as a slave by his brothers, serving an Egyptian master, and even when he was in prison for something he did not do. 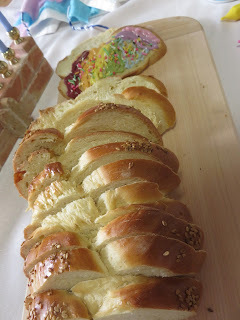 So my challah this week of Parsha Vayeshev is a bread of many colors, a slice that stands out! 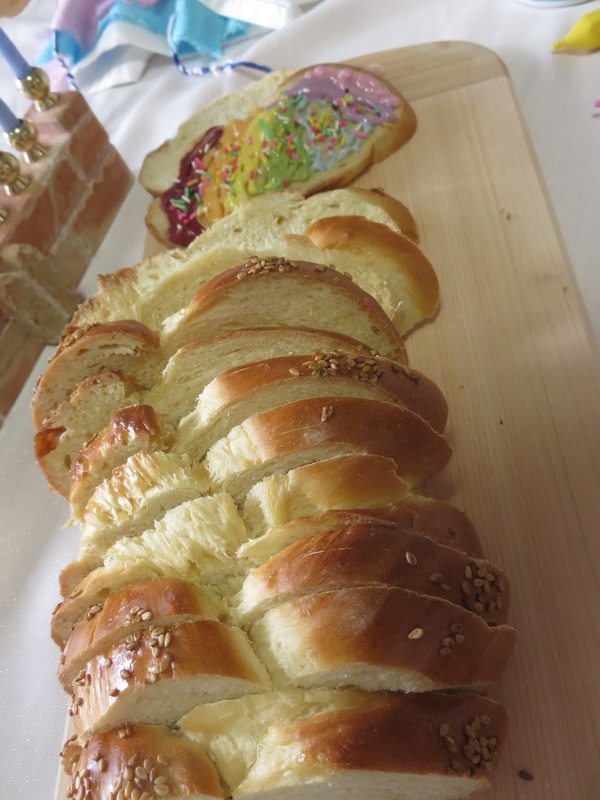 There are 12 slices of challah, representing Joseph and his brothers. And you can see there is Joseph, the 11th brother in the lineup, with the colors! It is also the first night of Hannukah tonight!! Surely it is no coincidence that this parsha and Hannukah are on the same day, well perhaps that is a Miracle! They are always near each other, but today just when Shabbat of Parsha Vayeshev finishes it is the time to light the candles of the first night of Hannukah. A beautiful continuation from Joseph son of Jacob, to Yeshua our Messiah, the Light that lights all the other lights! All Torah points to our Messiah Yeshua, and Joseph`s story is especially rich with parallels and prophetic pointers to the Light of the World, Yeshua. Wrongly accused and almost put to death (in Joseph`s case) by his own brothers, and all part of God`s great plan for Salvation and repentance. May this Shabbat be filled with light. As we light the candles, starting with the Shamash, or servant candle which lights all others may our hearts be open to know Messiah Yeshua and receive His Light. May we not hide our light but let it shine bright in this season and all year through!! Shabbat Shalom! Happy First night of Hannukah. You are the light of the world. A city set on a hill cannot be hidden. Neither do people light a lamp and put it under a basket. Instead, they put it on a lampstand so it gives light to all ain the house. In the same way, let your light shine before men so they may see your good works and glorify your Father in heaven.